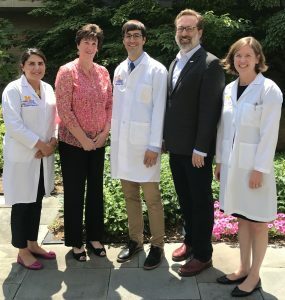 The multidisciplinary University of Michigan Post ICU Longitudinal Survivor Experience (UM-PULSE) clinic was selected as a 2018 Sepsis Hero in recognition for the clinic’s work in recognizing that many sepsis survivors need help after their discharge from the hospital. Many sepsis survivors who are treated in an intensive care unit (ICU) are left with cognitive, mental, and physical difficulties. Now called post-sepsis syndrome, this condition is not yet well recognized and Sepsis Alliance congratulates the UM-PULSE clinic for being at the forefront of post-sepsis care. The multidisciplinary clinic is directed by three physicians with specialties in internal medicine, pulmonary diseases, and critical care: Dr. Jack Iwashyna, Dr. Hallie Prescott, and Dr. Jakob McSparron. Dr. Iwashyna and Dr. Prescott are internationally recognized thought leaders on the long-term impact of critical illness on patients and caregivers, with a particular interest in the long-term impact of sepsis. The core clinical team at the PULSE Clinic are Dr. Jacob McSparron (an internist), Dr. Rima Mohammed (a pharmacist), and Ms. Mari Pitcher (a social worker). They are supported by ICU nursing, nutrition, physical therapy, the chaplaincy, and pet therapy. The clinic also works to reduce the risk of sepsis patients being readmitted to the hospital. Sepsis is the leading cause of hospital readmission, with 19% of patients hospitalized with sepsis returning to the hospital within 30 days of their discharge. Dr. McSparron and his colleagues want to expand the team further to include other healthcare professionals, such as physical therapists and occupational therapists.